My wife wanted me to blog her Peace Express e-book for her. Please give a warm hello to my wife. I was Inspired to write The Peace Express back in 2003. Because of all the unrest in the world today My husband and I wanted to use this platform to share the E-Book with Word Press readers. I initially, intended on engaging a graphic artist to do the illustrations for the book, when it suddenly occurred to me, why not have kids do them. The end result being that they could draw on their own experiences and express their feelings, through my words. I approached Beryl Bailey, the Principal at P. S. 195 where my nephew attends. She was delighted with the idea. Joanne Witz, the school’s librarian introduced me to the kids and helped me coordinate the project. Children need to feel that they can voice their opinion on how they feel. They want to have peace and feel safe to pursue their dreams. We as Parents, teachers and elective officials should encourage open dialogue with our children on the subject of peace. Let them know that we share their concerns also and we will work diligently to find solutions to ensure that they have a future. 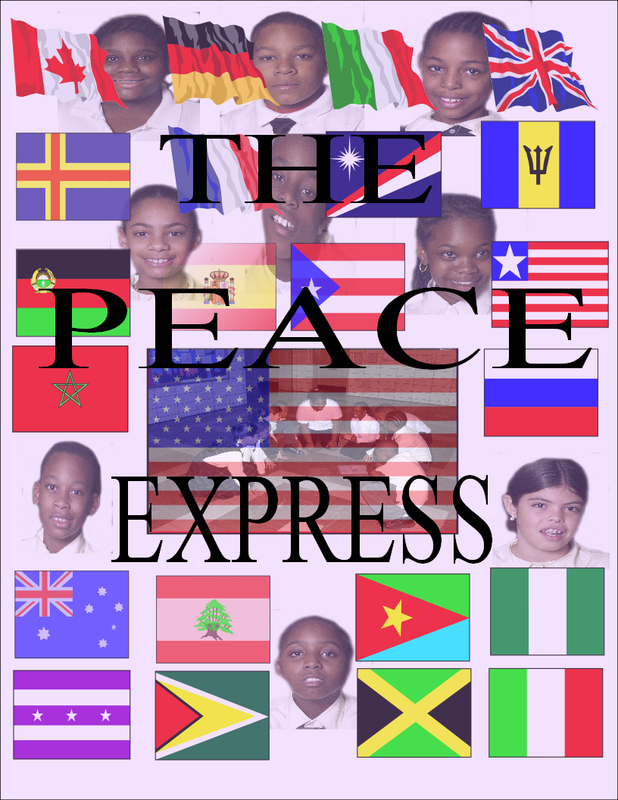 Anyone can download ‘The Peace Express’ E-Book and look inside to see what the kids had to say back in the year of two thousand seven. My husband has made this possible from off his web page. In order for this to happen he ask that you register for the download. The illustrations will impress you. We also would like you to show your support by feeling the same way for the kids. Note: The Peace Express is copyrighted. Downloading this PDF E-Book does not give exclusive rights to forward, reduplicate or sell it, without permission from the author Beryl E Kunilango. Thank you for your support and enjoy the e-book. FROZEN ICE SHAPE X. ONCE A REPLICA USED FOR A MAN NO LONGER WHITH US. Source: FROZEN ICE SHAPE X. ONCE A REPLICA USED FOR A MAN NO LONGER WHITH US. Posted on December 3, 2015 Categories UncategorizedLeave a comment on FROZEN ICE SHAPE X. ONCE A REPLICA USED FOR A MAN NO LONGER WHITH US. In the 90’s I started doing media Press and while on an assignments in 1992 for the Spike Lee’s Malcolm X premiere at the Apollo Theater, in Harlem N Y. While on assignment in 1992 at Apollo Theater. I took this picture of the frozen X (carved out of Ice) in the lobby. The backdrop of some of the entertainers who performed there added to the history of the Apollo Theater for me to capture something so unique. This image became a time capsule for me. I don’t imagine any one else captured it (if at all) the way I did. Denzel Washington portraying Malcolm X in the off Broadway play, “When the Chickens Come Home to Roost”. During that period in time, the then up and coming director, Spike Lee got together with Denzel to began work on his long-awaited dream project, Malcolm X. This film was shot at various points across the globe of which portrayed what Malcolm X life was about and shown to thousands who admired him while he was alive and thousands more after his assignation. Malcolm X Daughter, IIyasah Shabazz continues to represent what her father stood for in his absence. You can meet her at http://www.ilyasahshabazz.com/ and read information that (I hope) will restore your faith about the world as we know it today. Reverend Dr. Martin Luther King and Malcolm X came from two different backgrounds but lectured about the same ideologies that oppresses people of color. Because of that they both were assassinated. That is how Black people are dealt with especially when you can fundamentally bring large groups of Black people together for a common goal. However, as I right about this, the violence that exist today is nothing short of how thing has been since greed took over the earth, and the enslavement of people to benefited the wealthy. 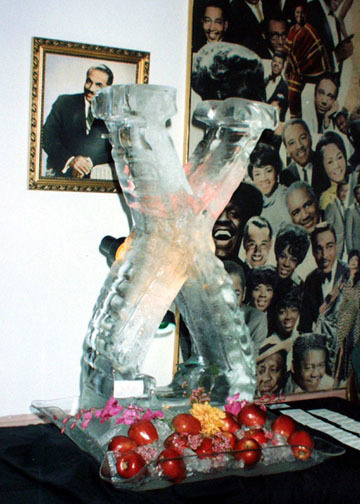 The photo of the Ice carved “X” shown here has been in my possession since 1992. I have not shown or published it. The Ice relict has melted but the image still remains. It is now being published on Word Press perhaps because no one knows it exist. Not even Spike Lee, Denzel Washington or IIyasah Shabazz. Posted on July 15, 2015 Categories Current Affairs, Photography, UncategorizedTags 1992, apollo theater, civil rights, current affairs, movie, nhk49, photography, spike lee1 Comment on FROZEN ICE SHAPE X. ONCE A REPLICA USED FOR A MAN NO LONGER WHITH US. 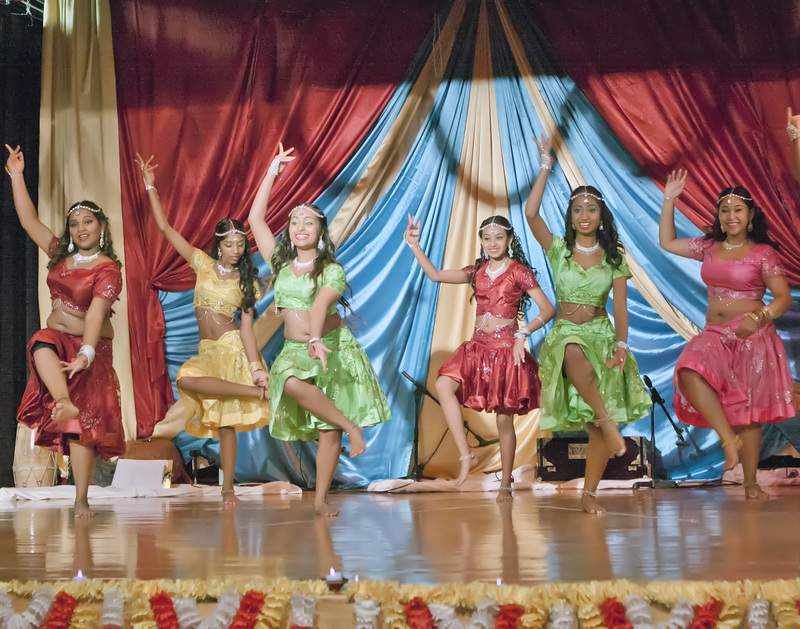 I was invited to attended a Hindu dance show on December 13, 2014 at PS 268, 92-07 175th St, Jamaica, NY. 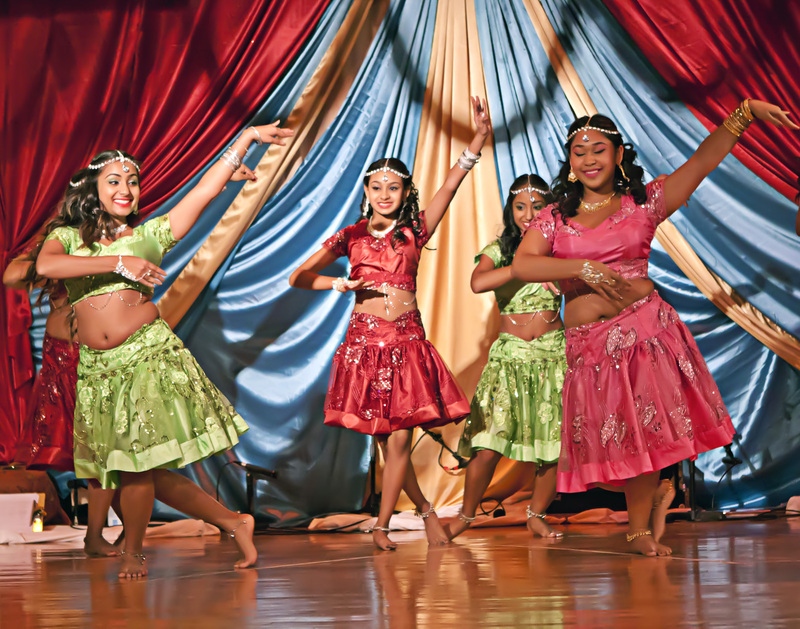 This was the first time I saw first hand how a community of Hindu people from Guyana and Trinidad Tobago cultivate and nurture their offspring in Queens, NY. How colorful and attractive the performers were, show-casing their culture in music and dance. 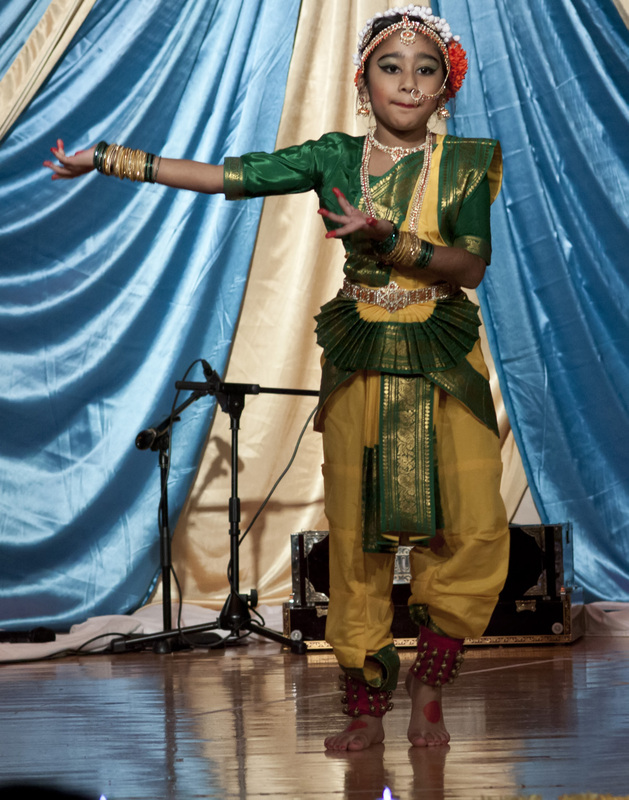 This is a eight year old of whom has been involved in learning Bharata Natyam Classical Dance since the age of four. 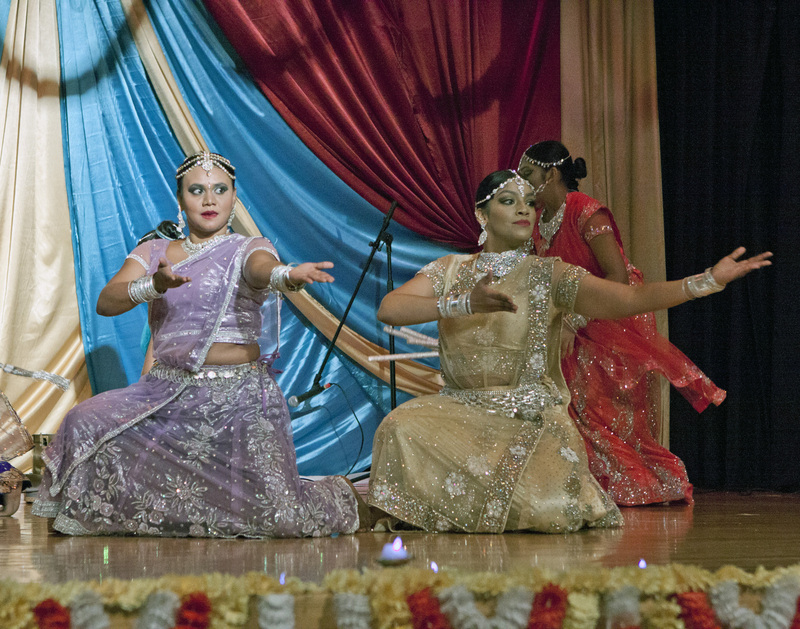 The following three images portray some of the teenagers performing the Bharata Natyam Classical Dance. 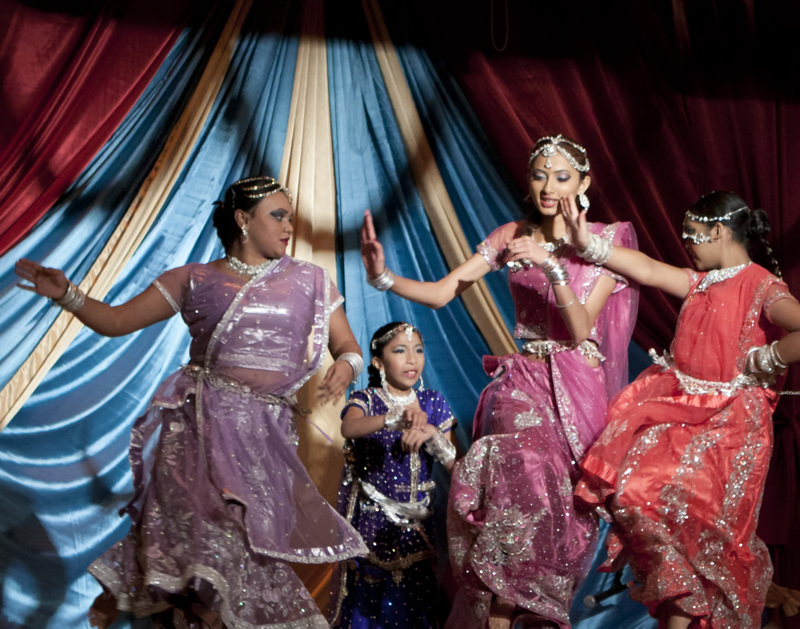 It is a graceful dance that uses facial expressions and hand gestures (mudras). 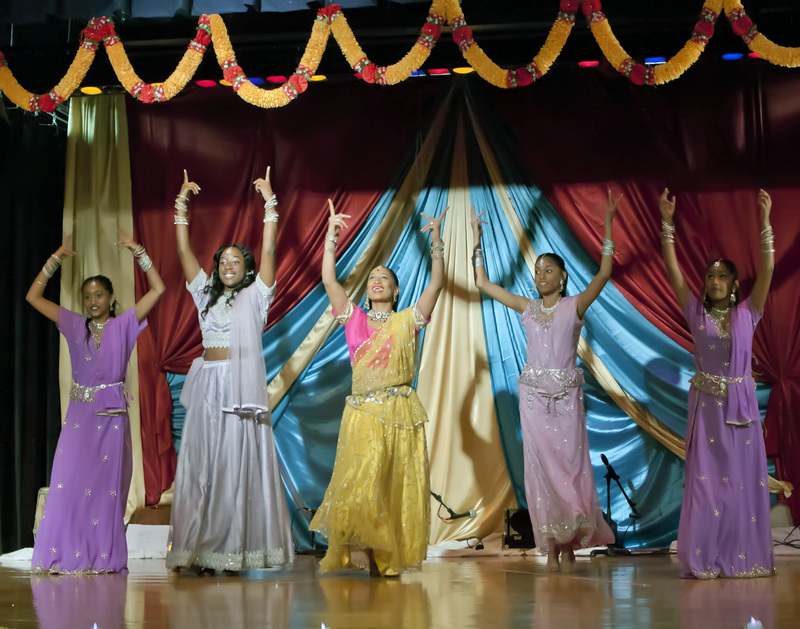 The event was presented by Prem Bhakit Ki Awaaz, which is located at 92-47 172nd St., Jamaica,NY]. Prem Bhakit Ki Awaaz translates to “The Voice Of Love And Devotion”, and also the tittle of a cable TV show promoting Hindu Sanatan Dharma. 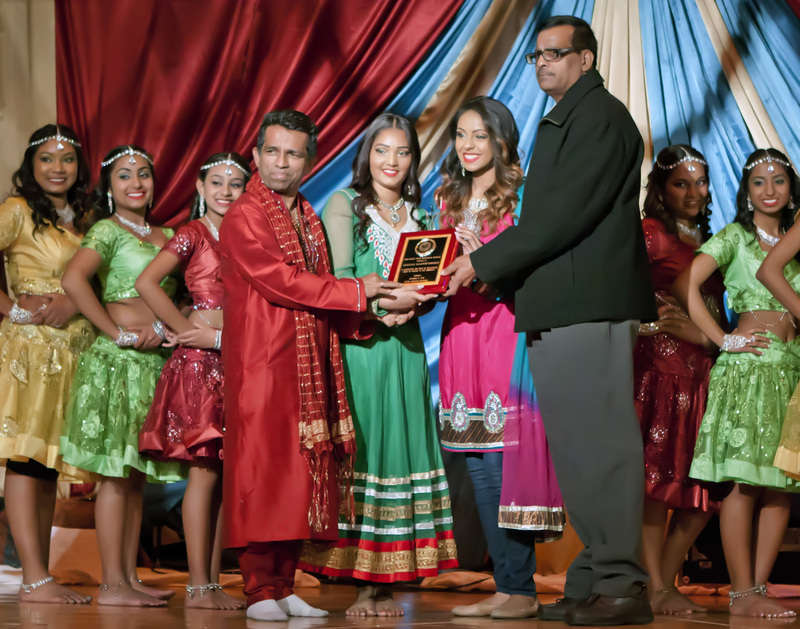 Through the inspiration of Prem Bhakit Mandir, under the Leadership of Pandit Narayan Latchana (seen in red attire, center left in the photo), this TV show brings the Caribbean Hindu community together, focusing on uplifting the youths. 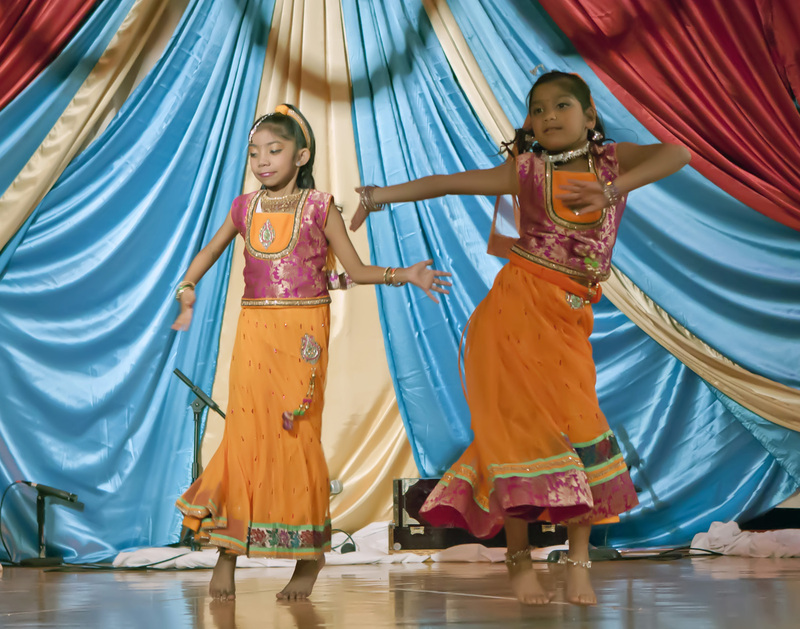 Younger dancers of Bharata Natyam Classical Dance. Sanatan Dharma is said to be the oldest of the major religions, otherwise known as Hinduism, and is a Sanskrit word meaning “Eternal Truth”, “Teachings” and “Tradition.” Just like the word “Namaste” which indicates the spiritual nature within all. Sanatan Dharma is the recognition of the spiritual essence of life and its infinite expressions. Sanatan Dharma/Hinduism (Hindu and Hinduism are said to be used in place of Sanatan Dharma) is the world’s most ancient culture and the socio, spiritual, and religious tradition of almost one billion of the earth’s inhabitants. Sanatana Dharma represents much more than just a religion; rather, it provides its followers with an entire worldview way of life and a coherent and rational view of reality. No one knows how old Sanatan Dharma is, and has no one founder. Hinduism is not confined to just a geographical location or an ethnic group anyone can become a Hindu. Unlike in other religions, Hinduism recognize the difference between belief and faith. A belief is something that may or may not be true. Faith is the assurance of what someone believes to be true, and the key to faith is experience, which is the central core of Hinduism. As for belief, it is fine to have beliefs as long as one is encouraged to develop a solid faith grounded in experience. All Hindus believe in the revealed scripture (the Vedas) and one Supreme God. All paths lead to a common goal of salvation, the soul’s freedom from a temporal body. Hindus also believe in the sacredness of life, compassion, service, reincarnation, and the laws of karma and dharma. 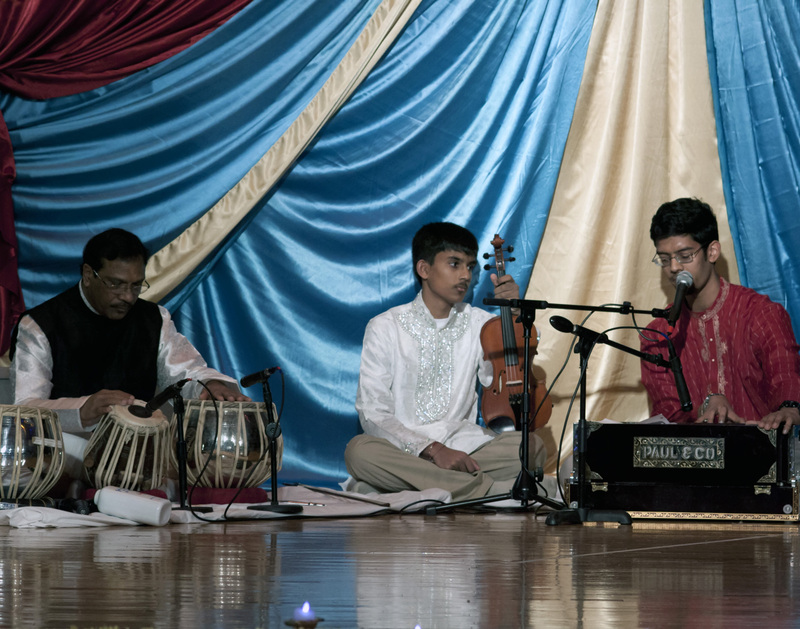 You can see videos of other Prem Bhakit Ki Awaaz events on Youtube. Contact information can also be obtained from there as well. I welcome comments from my readers on this subject. I for one missed out on learning about Hindu spiritual living beliefs. It is worth while learning about another spiritual entity that exist. As I mentioned earlier, one is encouraged to develop a solid faith grounded in experience. I hope you can agree. The United States Democratic Party made the decision to run their midterm election under minding the Presidents achievements. This decision was the platform for which they thought would help them defeat Republicans in the midterm elections. Oh what a mistake that was. Instead of running a campaign that reflects the achievement the President accomplished that turned this Country around from collapsing. They painted the picture to the public that President Obama is failing to meet what the American people want from him. As a Black President, the White Republicans despise him and can not stand for him to accomplish anything. However, he has defied them with doing what they said he is not capable of doing, successfully running the Country despite their disruptive opposition to ward him. If the American people who dislike the President would pay more attention to how Republicans do nothing to engage the President in comprehensive reform. They would know that the problem is definitely on the Republicans denying him from achieving anything that would insure confidence that he want to make this Country better. Republicans Shut down the Government and during the midterm elections this was not brought up. Even all the Republican disrespectful remarks made about President Obama was not addressed either. As much as President Obama tried to work with the Republicans before the midterm elections. Republican treated him as a Black man who didn’t know his place in a white society and displaced him as slave owners did back in the time of slavery. If it wasn’t for MSNBC keeping on top of the mentality of the Republican Party everyone would be brain washed by the media networks against President Obama. States across the south and mid-west cities acquire a double standard when it comes to the law between Blacks and Whites. I wish there was a better way to distinguish how people racially label Black and White people. It is only because how this country always want a person to label them self in a application form. Every nationality is considered White where as a Black person would have to check off African American ( which means Black). Other can apply but what is other. Education; the Republicans only move favorably for the wealthy White people. While keeping things the way they wont it for everyone else. Young people abandon education to deal drugs, become Rap artist and continue to fill up the jails. College athletes (White and Black) are under the radar when it comes to education. Education is offered but usually can take the back seat when a person goes to college on a athletic scholarship. This may not be what some people will wont to accept, but being wrong can out way the good when people can not stand up for what is right. Confusing the issue because you don’t like someone or some thing doesn’t make it fair to block out what you really stand for, and what you stand for means a lot. Hiding behind lies and deception doesn’t make you right. I am inviting you to visit my Gallery Website and view my commercial, editorial and public domain images. At this time I have a few free Images that you can view and download. My Commercial and Editorial Image requires a license before downloading. You can read the instructions on how to go about that on the website. The free downloadable images are available as a compliment for visiting the site and checking out my images that have a license. My free images are sized at 3000×2400 pix with a resolution of 300 unless otherwise noted. 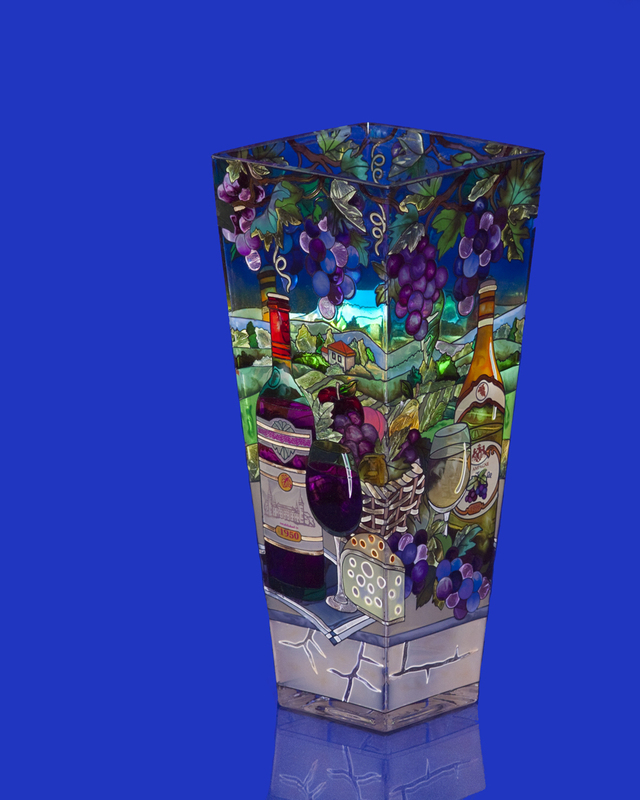 Click on this link to visit the Gallery Preview Website Page. Note that I have experience issues with Fire Fox and Internet Explorer when the page load up. You may need to refresh the browser if the imaging widget is black or goes black. The widget works fine after refreshing Fire Fox or Internet Explorer browsers. Here is a sample view of one commercial image that I have listed on site. I’m looking forward to finding out that you are associated with my Gallery website. This is what I been doing the past month by not working on W P.
Like yourself, taking picture is to capture time. By me living in the New York Metropolitan area, there are numerous places of interest for me to shoot. Between Tourist and other picture takers that visiting these places, too many of the same type of images are taken and circulated. The time line would vary but the images are considered duplicated. This brings the uses for them down. For that reason I tend to feature the ones I take or have taken, as showcases, expecting nothing to become of them. A couple of my interest (besides Media Press and Portrait photography) are incidental and Street Shot photography. My incidental images consist of objects that are not likely to exist anymore or not likely to have been photographed before. I filmed a sunset in Barbados and added incidental images to it. The clip is eleven minutes (music by Bob James in the background) and I would like to share it with you. Contact me to get the link to play or download the MP4 file. Street Shots are my favorite. At any given time (depending on the location) urban streets create interesting opportunities for capturing a moment in time. Meanwhile there is no chance your shot could be captured over and over again. I can create a one of a kind photo that can be replicated but not duplicated. In order for this type of photography to be beneficial for me the image must be timeless and published as an editorial. Below you can play a one minute clip of which is my second Street Shots (with music and captions) being posted at this time. The images where taken on Fulton St., Brooklyn, NY back in 2007. Select play without flash and HD. When viewing in full mode Images are not as sharp and clear as the original would look. This is because of reducing the quality of a video to upload (a smaller file size) for web viewing. It is in my best interest to let readers know that people should refocus on Civil Rights and not just on the tragic death of Michael Brown in Ferguson, Mo. The speed with which the shooting of Michael Brown resonated on social media helped propel and transform a local shooting into a national cause. 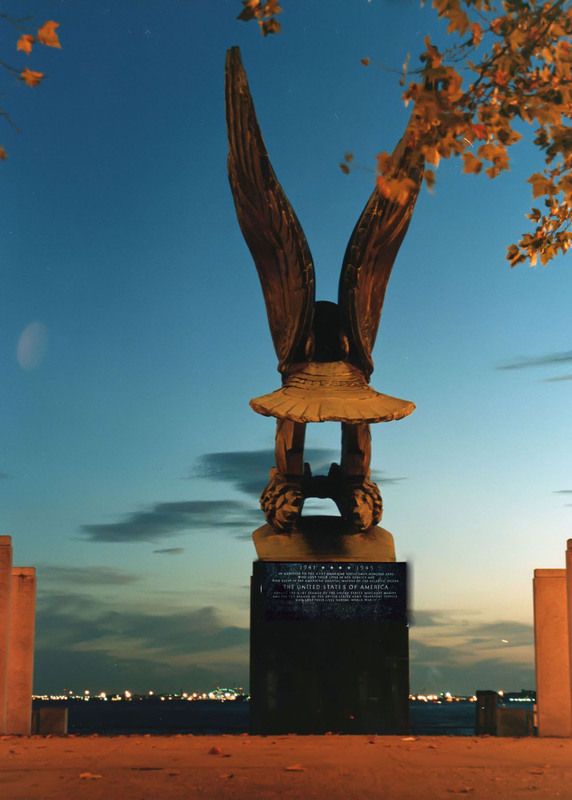 Watch the video on broken Civil Rights in Ferguson, Mo. All though discrimination practices all across these United States should also be at the forefront on what goes on behind closed doors. It is not something new. Imagine, if you can (because I can’t) That a Blackman in a toy section of a Department Store (holding a toy gun and talking on a cell phone prior to purchasing the toy) is shot to death because a White person(s) call 911. The person felt threatened by the man holding a toy gun. No questions asked, the Police arrive. Saw a Blackman with a toy gun and shot him to death. This to was distorted. All what was said is, it was an accident. An apology is usually the case when a White person murders a Black person. People of color too often suffer loses of a love one who has died before their time. Ironically, many underprivileged people of color are not covered in the news with the same exposure as Whites are by the White News Media. It is because of Social Media that local (particular) news media find it necessary to follow the coverage to keep up. Normally it would be business as usual, covering only high profile news reporting that brings in the money. Being murdered unjustifiably by the hands of police is the worst possible means for death. The abuse of power is what people of color are enduring everyday. It breaks my heart to say that men and women died on behalf of the Civil Rights movement back in the sixties. Preserving Civil Rights should be a priority that everyone should be focusing on in the 21st century. With all the problems going on in these United States, it makes people sick knowing that Civil Rights hasn’t resonated for everyone. Instead it is not to be tolerated and should be abolished think some people. Can anyone see through the flaws that shame this country. If so, Word Press should continue to bring people closer to force a solution. Looking at how Social Media is working in other parts of the world I found a few interesting videos and articles you should take time to look into from the New York times. The Nigerian social media outlets jokes about the Ebola epidemic. Watch the times video. Find out how Spain’s national police embraces Social Media. As if you didn’t know that they are not the only law enforcement agency that uses it to locate people of interest. When a European arrest warrant was issued recently for Brett and Naghemeh King, who took their cancer-stricken child out of a Hampshire hospital in the south of England without permission, the Spanish police did what has become increasingly common in the search for missing or wanted people: They posted an alert on Twitter. Within three minutes, the police received a Twitter message saying that the British family’s minivan had stopped for gasoline the night before on a highway in Eskoriatza, in northern Spain, and was headed south. In coordination with British authorities, the police centered their search on Spain’s touristy southern coast. Two hours later, they received a call from a hotel receptionist near Málaga, who had seen the police alert and checked the license plate number on the minivan. The parents were then detained. The department’s Twitter account, @policia, has become the most popular maintained account the law enforcement agency has, just ahead of the F.B.I., with a million followers in a country of 47 million people. I know that what is going on in the Islamic State in Iraq and Syria is something to keep a eye on. They are displaying extraordinary deftness with media, using every contemporary mode of messaging to recruit fighters, intimidate enemies and promote its ideology. ISIS propaganda, for instance, has strikingly few calls for attacks on the West, even though its most notorious video, among Americans, released 12 days ago, showed the beheading of the American journalist James Foley, threatened another American hostage, and said that American attacks on ISIS “would result in the bloodshed” of Americans. This diverged from nearly all of ISIS’s varied outputs, which promotes its paramount goal to secure and expand the Islamic state. Experts say that could change overnight, but for now it sharply distinguishes ISIS from Al Qaeda, which has long made attacks on the West its top priority. On that (whistle) note, lack of vision through Social Media in regards to texting has long become an epidemic. This has rendered too many people unable to communicate among each other verbally and are constently putting themselves in danger not paying attention to what is going on aroud them. Video games potentially and psychologically instill violence in audiences that play them over and over again. With the lack of intelligence among some of our young people today, they shouldn’t be even allowed to purchase or rent them. With little resistance, our youth can be recruited into unlawful engagement against our Government and others. Another problem is how some news outlets, distorts the coverage of breaking news or news in general. Would this be because they are fabricating what is happening based on censorship? Consequently, I believe the Primary reason is based on satisfying TV promoters and sponsors who finance them. Impressionable people often use unfounded information of which they heard, and run with it as if it was the gospel truth. The information being passed around creates rivalry among people of which tares away at the fabric we call common sense. Does your elevator reach the top floor. If greed was Civil Rights, many people would be rich. We don’t have to resort to violence against one another in order to coexist. 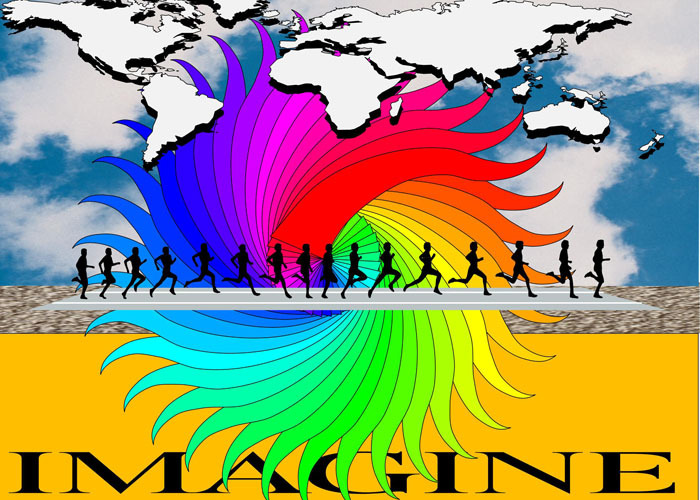 Listen to John Lennon singing Imagine.